Our new and used Toyota dealership in Everett, Washington invites new car shoppers that are looking for affordable yet commanding vehicles to visit us to meet the 2018 Toyota RAV4. This spirited SUV can stand up to not only the everyday challenges of the road but takes your off-roading adventures head on! Feel free to browse our Rodland Toyota's competitively priced inventory online from your nearby Mukilteo, WA home or drop by to see us for a more personalized experience. We offer customized shopping plans that include professional financing assistance so that all our neighbors can drive home in the 2018 Toyota RAV4 that suits them. Before visiting our new and used Toyota dealership near Mill Creek, Washington, don't hesitate to value your trade-in online with help from our Rodland Toyota auto appraisal form. Our vehicle appraisal services make it easy for drivers in the area to upgrade to a stylish 2018 Toyota RAV4 with ease. Ready to see how the 2018 Toyota RAV4 compares to the competition? When put up against a similarly equipped 2018 Ford Escape model, the RAV4 stands out with ease. This Toyota SUV boasts a standard towing capacity of 2,900 pounds while the Ford can only tow 2,000. Both SUVs have the option of a cargo area cover, but it's the 2018 Toyota RAV4 that features a Smart Key System as an optional feature as well, a system that is not available on the Ford. When compared to the 2018 Nissan Rogue, yet again, the 2018 Toyota RAV4 comes out on top. 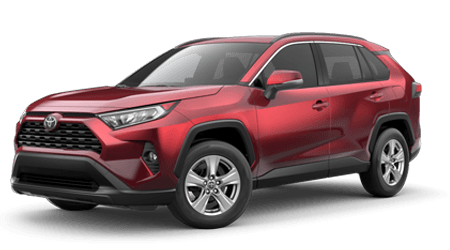 Not only does the RAV4 boast a lower comparably equipped price but beats out the Rogue in terms of standard towing capacity, engine displacement and limited slip differential. The 2018 Toyota RAV4 also offers Parking Distance Sensors, a power sunroof and front knee airbags, all features that are either an add-on expense or simply not available should you choose the Nissan Rogue. Rodland Toyota has a 2018 Toyota RAV4 in stock for you, so don't hesitate to visit us in Everett, Washington today!